Description : This machine is suitable for sewing thick materials, bags, suitcases, bags, shoes, sports shoes. Hats, tents, canvas, golf gloves, garments, sports goods, diving suit, sofa, leather products, tubular products. Open-style front cap for easy maintenance, 3,4 points, zigzag can enhance the sewing part of the joint force With double presser, feed with teeth up and down fluently, uniformity and nice thread tracks. Use big hook do not need to change it continually, save fine and improve the efficiency. Can be open the cover on the head, maintained expediently when it broken with advanced deign, high work capability,and easy maintain. Looking for ideal Zigzag Sewing Machine Manufacturer & supplier ? We have a wide selection at great prices to help you get creative. 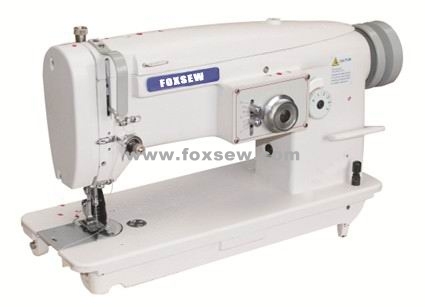 All the Synchronized Zigzag Sewing Machine are quality guaranteed. We are China Origin Factory of Heavy Duty Zigzag Sewing Machine. If you have any question, please feel free to contact us.